The record is made up of 1 volume (230 folios). It was created in 24 Jul 1935-15 May 1937. It was written in English and Arabic. The original is part of the British Library: India Office The department of the British Government to which the Government of India reported between 1858 and 1947. The successor to the Court of Directors. Records and Private Papers. I'O iroli tical He side nt, -bushire. Repeated to Political Agent A mid-ranking political representative (equivalent to a Consul) from the diplomatic corps of the Government of India or one of its subordinate provincial governments, in charge of a Political Agency. , Bahrain. 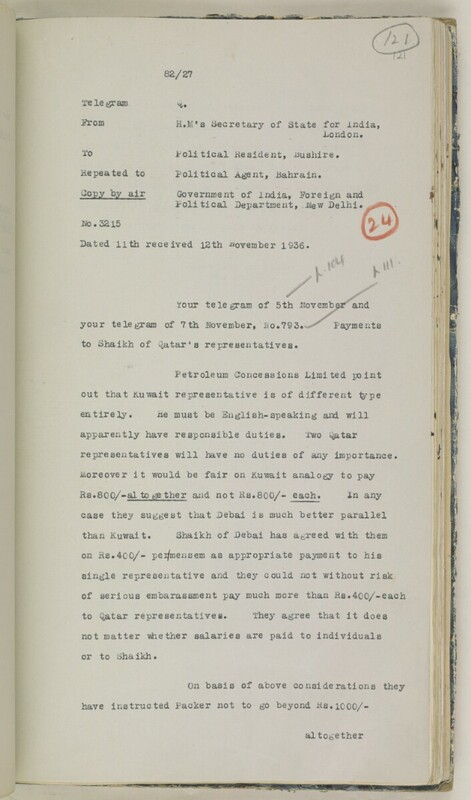 Dated llth received 12th -wovember 1936.
to Shaikh of Qatar*3 representatives. representatives will have no duties of any importance. The volume contains correspondence and telegrams between the Political Agent A mid-ranking political representative (equivalent to a Consul) from the diplomatic corps of the Government of India or one of its subordinate provincial governments, in charge of a Political Agency. at Bahrain and the Political Resident A senior ranking political representative (equivalent to a Consul General) from the diplomatic corps of the Government of India or one of its subordinate provincial governments, in charge of a Political Residency. at Bushire, Anglo-Persian Oil Company (APOC) representatives and ‘Abdullāh bin Jāsim Āl Thānī, Sheikh of Qatar, in regard to the oil concession and the beginning of the oil exploration in Qatar. The volume includes: Programme of operations in Qatar from November 1936 to May 1937 (folios 110-118) and 'General and brief note on the water drilling operations of Petroleum Concessions Limited in Qatar' (folios 209-212). The documents in the volume are mostly arranged in chronological order. There are notes at the end of the volume, (folios 215-221). The file notes are arranged chronologically and refer to documents within the file; they give a brief description of the correspondence with reference numbers in red crayon, which refer back to that correspondence in the volume. The main foliation is written in pencil, circled, and can be found in the top right corner of the recto The front of a sheet of paper or leaf, often abbreviated to 'r'. side of each folio. The numbering commences at the title page with 1, then 2-37; 38 and 38A; 39-55; 56 and 56A; 57-198; 199 and 199A; 200 and 200A; 201-217; 218 and 218A and it carries on until 225, which is the last number given to the back cover. There is also a second foliation sequence, incomplete.